Chum salmon is a species of salmon like the coho salmon, king salmon, and Atlantic salmon. It is generally caught in the fall when its eggs are ready to be harvested and turned into ikura used in sushi dishes. 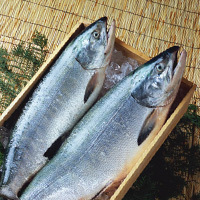 Chum salmon serves as an excellent source of nutrition especially when it comes to vitamin D and vitamin B12. The calories in Chum Salmon per 80g(1fillet) is 106 calories. Chum Salmon is calculated to be 133Cal per 100 grams making 80Cal equivalent to 60.15g with 17.84g of mostly protein、3.28g of fat、0.08g of carbohydrates in 80g while being rich in vitamins and minerals such as Vitamin D and Vitamin B12.